On June 17, the U.S. Consul General in Dubai Robert Waller and Chief Executive Officer and Managing Director of Dubai Electricity and Water Authority and Vice Chairman Dubai Supreme Council of Energy His Excellency Saeed Mohammed Ahmad Al Tayer signed a memorandum of understanding (MOU) to collaborate on the development of Solar Decathlon Middle East. 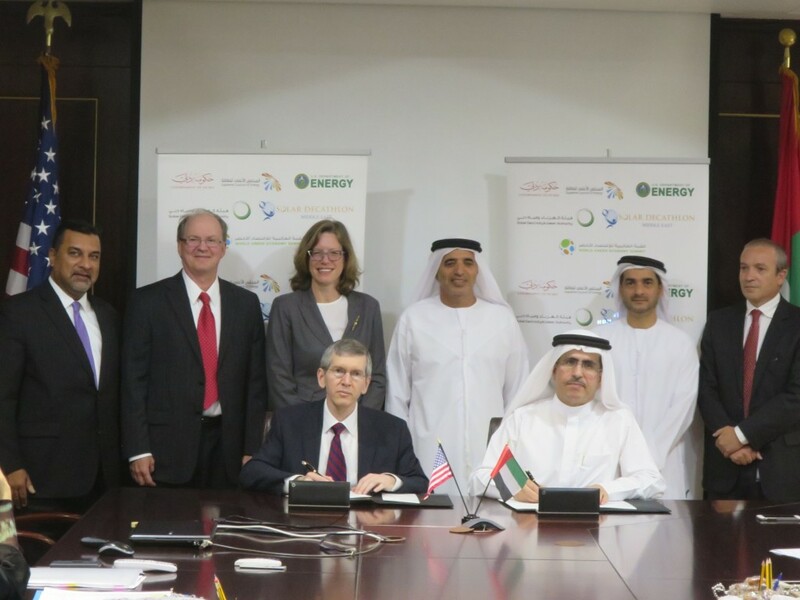 The MOU marks the first step toward a Solar Decathlon competition to be held in Dubai and spells out a collaboration between the U.S. Department of Energy and Dubai to produce two Solar Decathlon Middle East competitions: the first in 2018 and the second in 2020. A call for applicants for the 2018 competition will be issued this year. Solar Decathlon Middle East will integrate local and regional characteristics while adopting the same philosophy, principles, and model used by the U.S. Department of Energy Solar Decathlon. His Excellency Al Tayer said he believes Solar Decathlon Middle East will be a unique opportunity to generate incentives among Emirate students to design buildings that are energy-efficient and self-sufficient and contribute to sustainable growth. Per the MOU, Dubai and the United States will exchange information regarding rules, scoring, judging, safety, and site and team selection for Solar Decathlon Middle East. In addition to educating students, the competition is intended to encourage private-sector participation in the energy sector and promote sustainable development and land-use planning. Since the first Solar Decathlon in 2002, 224 collegiate teams—nearly 32,500 students—have participated in the flagship U.S. Department of Energy Solar Decathlon, Solar Decathlon China, Solar Decathlon Europe, and Solar Decathlon Latin America and Caribbean. The next U.S. competition will be held in Irvine, California, October 8–18, 2015. This entry was posted on Thursday, June 18th, 2015 at 4:54 pm and is filed under Events, Solar Decathlon, Solar Decathlon Middle East.